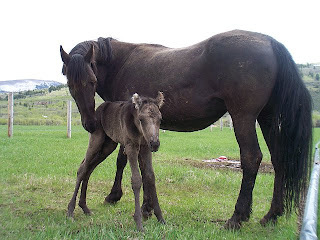 Adding a baby horse to the clan has become sort of a "Driggs Memorial Day tradition" for us. 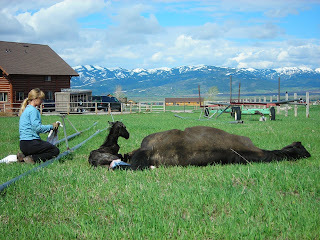 This year was no exception, with our mare Finis delivering a beautiful, tall Tennessee Walker colt. A couple of these photos might be considered "graphic," but in person it was incredible. 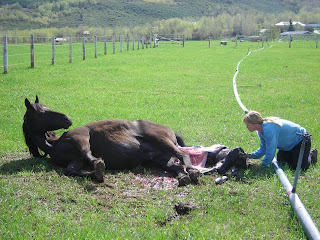 This was the first horse birth I've actually seen. Usually they just pop out magically in the middle of the night, and the foal is running around by the time you see it in the morning. We were fortunate this time, as it happened during the breakfast hour and Joanne and I were both around. 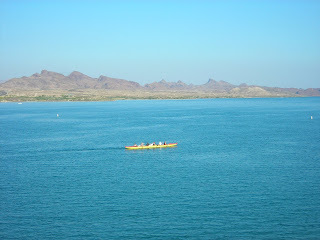 Plus, it took place during a pleasant break between rain/snow storms. Timing is everything. 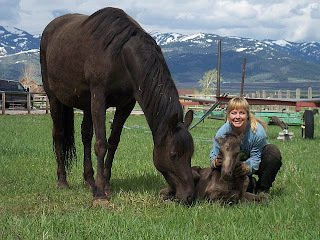 Joanne has experienced many live horse births, and is great at immediately "imprinting" the foal. It definitely makes a difference in how friendly and trainable the horse becomes. We're still open to names for our new black colt, so feel free to drop a comment with suggestions. He's already showing a sweet disposition: friendly, happy, curious, confident. Finis is an excellent mother. The new addition brightened up an otherwise dismal, rainy, snowy, windy Memorial Day weekend. We're hoping for improvement later this week, but I felt bad for everyone who was out camping and fishing over the holiday. 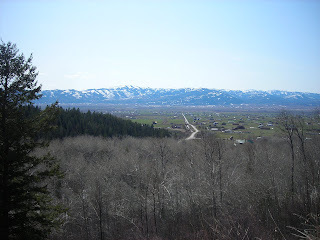 Weather in Driggs can often be fickle this time of year, but this "spring" has been the most brutal of any we've experienced in that regard (14 years and counting). 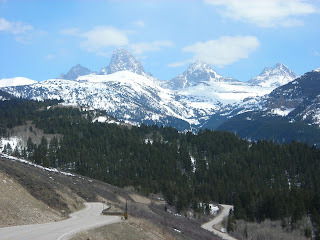 As the old timers used to say..."we have two seasons in Teton Valley, Idaho: July, and winter." 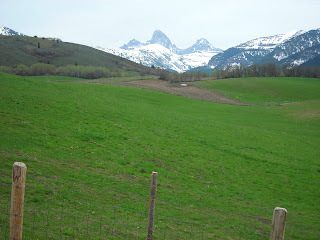 Last Monday, it was snowing in Driggs. 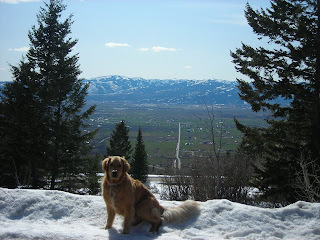 Today, just a week later, it's 75-degrees and Teton Valley is springing to life. It has been a long time coming, and we're all loving the evidence of actual photosynthesis right here in Idaho. I was starting to doubt whether it would ever happen this year. After letting the trails dry out for a few days, Joanne and I grabbed the mountain bikes and headed out for the first local ride of the year. 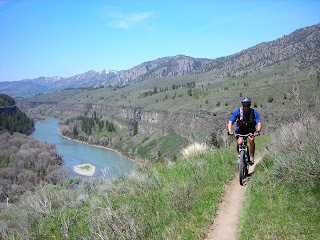 A 30-minute drive took us to Swan Valley and the South Fork of the Snake River Bench Trail, with some sweet singletrack and epic views. It was awesome to be out in short sleeves and shorts...but we quickly realized how woefully out-of-biking-shape we are compared to most years at this time. 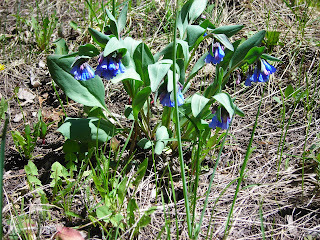 Wildflowers were just beginning to make their brave appearances. 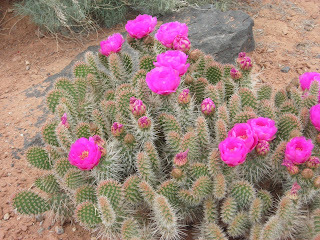 With all the winter and spring snow we had, it should be a memorable year for blooming in the high country. 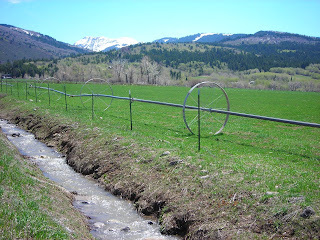 Local Driggs farmers are now finally able to get rolling. 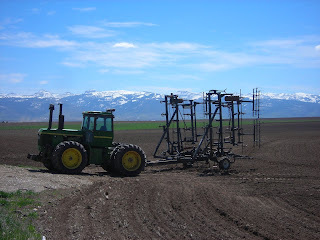 It's good to see the seed potatoes and barley being planted, with hopes that snow and freezing temperatures stay away for a few months now. Time will tell.